"Expertly crafted, ingenious and absorbing." The Philadelphia Inquirer.The #1 Bestseller by the author of "Jurassic Park." 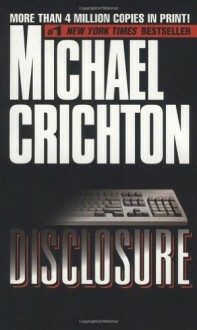 As he did in "Rising Sun," Crichton focuses on a topic as close as today's newspaper headlines: sexual harassment. Tom Sanders is an up-and-coming executive at the computer firm DigiCom. When his new boss turns out to be a woman who is both his former lover and a business rival, Sanders determines to be professional. But after a closed-door meeting, the woman accuses him of sexual harassment. It's her word against his, and suddenly Sanders finds himself caught in a nightmarish web of deceit in which he is branded as the villian. As he scrambles to save his career and his reputation, Sanders uncovers an electronic trail into DigiCom's secrets . . . and the cynical scheme devised to bring him down.